Before leaving Adelaide, there was a final bucket list item to tick and just like when I was in Perth, it involved an island. This time, it was the aptly named Kangaroo Island which is acknowledged to be one of the best places in Australia to enjoy rugged coastal scenery and some untamed wilderness that is home to a virtual zoo of wildlife. Most of the first day of my three-day tour was spent on the fertile Fleurieu Peninsula which is patterned with vineyards, olive groves and almond plantations. We visited a couple of wineries in what is known as the McLaren Vale Wine Region and I reacquainted myself with the divine tasting mead. Other wines, especially some of the reds are reputed to be superior to anything produced in the Barossa Valley. We shared a bottle over lunch at Victor Harbor (yes, that is the correct spelling) on what is known as the Encounter Coast. Just off-shore at Victor Harbor is the boulder-strewn Granite Island which is connected to the mainland by a causeway built in 1875. A popular tourist attraction is to ride the old horse-drawn tram out to the island where there is a penguin colony. Tours to see the penguins start at about the same time we were boarding the ferry from Cape Jervis. The 13km journey across Backstairs Passage took about 30 minutes so the sun was setting as we arrived at the town of Penneshaw on the island. The second day took us to Seal Bay where we got up close and personal with some sea lions. We were under the close watch of a ranger but still allowed within about 15 metres of them. In the afternoon we climbed Prospect Hill which offered great views of Pelican Lagoon and out over Pennington Bay to the south. We finished our day a place called Little Sahara on the southern coast. As the name suggests, the huge sand dunes here that we surfed down on special boards offered some great fun. The third day was the best because we explored the Flinders Chase National Park at the western end of the island. The highlight and most photographed place on the island is the Remarkable Rocks. Out on an exposed promontory, these amazing rocks have been uniquely shaped by sea and wind. We also went to the impressive rock archway called Admiral's Arch near the remote lighthouse on Cape du Couedic. From the boardwalk we could see a colony of New Zealand fur seals lazing on the rocks below us. We had lunch at nearby Hansons Bay where I did a lovely bush walk before returning for our ferry. Near the picnic area here we watched as a koala descended one tree and then climbed another in front of us. It was exciting because they sleep about 19 hours a day! Apart from that, we saw at different times on the tour penguins, kangaroos, wallabies and an echidna all in their natural habitat. There were also various birds such as the wedge tail eagle and Cape Baron goose. Because it was the winter season, our accommodation for the two nights was a hut and little farmhouse. During summer it's the more basic camping and sleeping in swags. We still had a big camp fire outside for cooking, making billy tea and roasting marshmallows. Telling stories and having a laugh around the campfire is always a memorable part of such as tour. The guide kept us amused with all kinds of tales and his stew was delicious. Good times and happy memories that I’d soon be taking with me to the warmer climes Queensland. Adelaide is overlooked in the east by the Mount Lofty Ranges that are often referred to as simply the Adelaide Hills. This is the gateway to the Barossa Valley that is Australia's premium wine growing area. Many of the top wineries such as Jacobs Creek, Penfolds and Wolf Blass are located there. The vineyards aside, the idyllic towns and beautiful scenery of the valley make for a great day trip that I did with my friend and his wife. The summit of Mount Lofty (727m) is generally the first stop on such a trip because if offers and had spectacular views over Adelaide, the Fleurieu Peninsula and Gulf St Vincent. Although it was a sunny day, it was a cold wind at the top so we were soon back in the car and heading to the historic town of Hahndorf. It is undeniably pretty with German flags hanging from sandstone buildings and colourful flowers growing in half wine barrels. That aside, it has an interesting past and the distinction of being the oldest surviving German settlement (1839) in Australia. A scenic drive north through the Torrens River Gorge leads to Gumeracha. This hardy little hillside town attracts tourists in the area because it is home to the largest rocking horse in the world. It should just be called the largest horse because it doesn’t rock but it is impressive and part of a toy factory selling handmade wooden toys (and big rocking horse souvenirs!). For the record, it stands 18.3m tall, has a length of 10.5m, weighs 25 tonnes and yes, we climbed to the top of it. Into the Barossa Valley, we stopped at Menglers Hill Lookout for lunch. This offered a lovely panoramic view over the floor dotted with vineyards. We visited a few wineries including the famous Penfolds and another one called Chateau Dorrien. It's one of the few places that make the honey wine called mead and I bought a bottle there. There are a few different varieties and a couple are best to drink warm. Ideal in winter but either way, it is oh so good! My mother's great-grandparents were German and settled in the valley many years ago. I took some time out to find the road that they named and see where their farm was. I also found the small Lutheran cemetery where they are buried together with a few other relatives from that side of the family. Unfortunately after doing all that it was nearly dark and we were a bit late to visit Jacobs Creek winery but we'd had an excellent day anyway. And then there were two. We still had some 1,300km to travel but our initial stop would be the Great Australian Bight. The marine park here is the second largest in the world after the Great Barrier Reef and is home to migratory whales from July to August. Although it was too early for whale watching it was worth stopping just for the great views of the Southern Ocean, sand dunes and the towering Bunda Cliffs. We then pushed on to the raggedy fishing town of Ceduna which in the local Aboriginal language means ‘a place to sit down and rest’. We did exactly that for a while before pushing on to Port Augusta which on the map at least, appears to be at the biggest crossroad in Australia. From this town at the head of the Spencer Gulf, you can treat it as the gateway to the vast outback, Flinders Ranges or Eyre Peninsula. Highways and railways roll out toward Kalgoorlie in the west, Alice Springs and Darwin in the north, Sydney and Melbourne in the east and our destination of Adelaide in the south. Not a bad position! As we passed various road signs I thought for a moment about Lou trying to catch a final ride to catch his flight. I’ll never know but I somehow doubted that he made it. We stayed a final night in Port Augusta and took a walk around the old town centre the next morning. It has some elegant buildings and a pleasant waterfront where some locals were fishing. From there, it was just a four hour drive to the South Australia state capital. It had been a strange trip but I’d made it and ‘all’s well that ends well’ as they say. Adelaide has a culture and sophistication that you’d expect from the 'City of Churches'. The largest of these is St Peters Cathedral which majestically overlooks the Adelaide Oval. This famous old sports arena is used for cricket in summer and Australian Rules football in the winter. I took time to visit the excellent museum housing personal items of cricketing legend Sir Donald Bradman. Just across the pretty River Torrens is the lush botanic gardens and city zoo. The river also meanders past the Adelaide Golf Course on its scenic route out to Gulf St Vincent. Most of the tourist sights are within walking distance of the Rundle St shopping mall and many are strung along North Terrace just one block away. Aside from the Botanical Gardens, the South Australia University, Art Gallery, Museum and Library are all here. Both the art gallery and museum offer free tours twice a day. These are an excellent way of taking in the highlights (including an enormous giant squid) but I was also glad I had more time to enjoy the exhibition on whales and renowned Antarctic explorer Sir Douglas Mawson. Central Adelaide has several attractive squares named after people who were significant to the city's history. In the large Victoria Square there is an impressive fountain that represents the three rivers Adelaide sources its water from. I did a tour of the Town Hall and the enthusiastic guide had so many stories to tell it lasted nearly two hours. Amid the European colonial architecture of this area are several alluring markets selling food, art, craft, clothes and jewellery. A couple are Sunday markets but the superb Central Market offer about 250 stalls from Tuesday to Saturday. I stayed with a friend out in the suburbs was had to rely on buses every day to get to the city. The unique transport system here makes commuter life simple. Outside the central city area, the buses run on specially designed tracks which essentially make them like trains. The driver told me it's a German system called the O-Bahn. The buses are adapted with small guide wheels at the front that enable them to run smoothly at up to 100kmh. As he was chatting to me he sat happily with arms folded while the bus steered itself. The car belonged to Jamie and we wanted to enjoy the journey as much as the destination. But our other travel buddy Lou was only focused in Adelaide and seemed in a big hurry to get there. He was a nice guy but wasn’t interested in the stark beauty of the southern outback that we’d pass through along the way. He occupied the back seat either sleeping or reading his book. After a long day on the arrived we arrived in the brash mining town of Kalgoorlie-Boulder. It was dusk but I could sense Lou was agitated when we decided to stay for the night. If it was up to him we’d be driving in three shifts, day and night. I dared not suggest that we play the world’s longest golf course on our way east. The extraordinary Nullarbor Links stretches 1,362km south to Norseman and all the way across to the town of Ceduna in South Australia. The holes are scattered along the route and the only water hazard is the risk of running out of it! That would have been a lot of fun but no, it wasn’t going to be that kind of trip. We were up early the next morning and on the road to the crossroads township of Norseman. It was here we began the long haul east across the mighty Nullabor Plain. This is one of the iconic Australian road trips where you simply sit back, relax and enjoy the big empty skies and long horizons. This truly is about the journey as much as the destination. Translated, the word ‘Nullarbor’ means treeless and that’s exactly what the plain is. The mighty Eyre Highway runs parallel with the Trans-Australia Railway line across the southern edge of the Nullabor Plain. 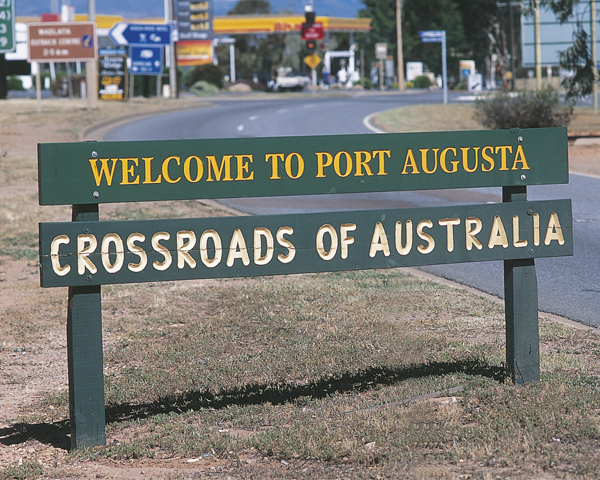 It includes Australia’s longest stretch of dead straight road - 145km, the so called Ninety Mile Straight. The plain is low shrubs and tussock grass for as far as the eye can see. It’s as vast as the outback but greener and prettier. There are roadside campsites every 250km but we pushed on to Border Town, so called for obvious reasons. The following day we’d set our watches forward 90 minutes and enter South Australia. But Lou’s discontent over our lack of progress grew to genuine anxiety and the reason emerged. Apparently he had to be in Adelaide by the following afternoon for a flight to Sydney! I don’t know what he was thinking not speaking up or travelling with us at all. The 2,700km journey across the country is similar to going from London to Moscow! Did he really imagine that it would only take a couple of days? We were a little bewildered by his lack of planning and awareness. Maybe he was too shy or embarrassed to speak up earlier and I felt bad that we’d held him up. There were no hard feelings though. He apologised for causing problems, left us some money for fuel and jumped on a truck that night heading for Port Augusta. I wished him luck and had my fingers crossed he’d make it.